sen joe mcpherson responds to moon griffon. 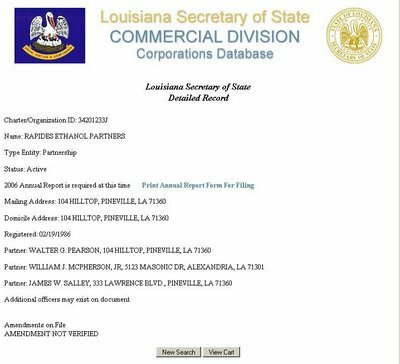 michele godard & kalb.com reported on their noon broadcast and from their website and even so the company is still active this doesnt mean that in the future it couldnt get into louisiana mandated ethanol use - and profit from it which goes right back to sen mcpherson's vote in support of hb685. so no we arent convinced and still say that the governor should veto this bill because it just doesn not look good from any side. the thing is, is that unlike what senator mcpherson said that he "trusts the governor" we dont trust the governor, especially her advisors. governor blanco please veto this bill just think the higher prices will begin to kick in next summer and fall just as you are nearing a reelection bid. House Bill 685 has won approval from the legislature and would effectively require that gasoline containing ethanol be sold in the state. Parties from both sides of the argument are weighing in on the debate as the bill sits on the Governors desk for her approval. 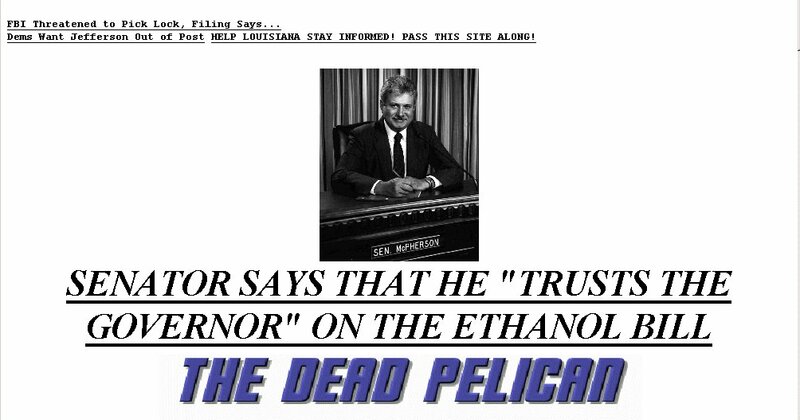 One local legislator has been taking heat from a Louisiana talk radio host Moon Griffon for his possible business interest in the ethanol issue. In a phone interview Friday morning Senator McPherson says he has no connection with the Louisiana ethanol industry and will not financially benefit from House Bill 685. McPherson goes on to explain in the mid-1980’s he formed a partnership to invest in ethanol plants in New Mexico... click here to read more. **updated** 4:58 pm cdt friday 09 june 2006 now chad has weighed in and linked to kalb's story. another reason the governor should veto hb 685 (besides the fact that its being fronted by state rep. francis c. thompson) is that state senator joe mcpherson voted "yea" for this bill which many claim will raise the price of gasoline coupled with the fact that automobiles using ethanol get less gas mileage i.e. more fill-ups, is this little jewel we came across. turns out that la state senator joe mcpherson is a partner in a louisiana corporation called "rapides ethanol partners." 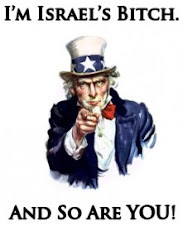 an email to senator mcpherson seeking comment has not been returned..